Adoption of EMV within the United States has met many challenges. One of which is in the restaurant industry, where the pre-authorization and tip process conflicts with the way EMV chip cards are processed. 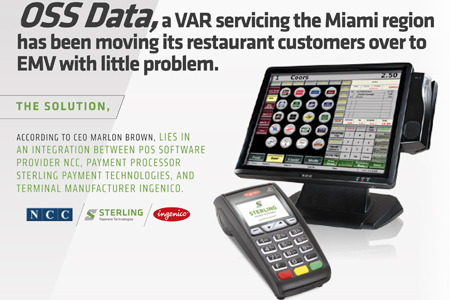 However, OSS Data, a VAR servicing the Miami region has been moving its restaurant customers over to EMV with little problem. The solution, according to CEO Marlon Brown, lies in an integration between POS software provider NCC, payment processor Sterling Payment Technologies, and terminal manufacturer Ingenico. An example of this partnership in action can be seen with a recent EMV upgrade the VAR performed for one of its customers, I Love Tacos Restaurant. OSS Data first began working with I Love Tacos in late 2013 after a cold call led to a product and services demo. At the time, the restaurant was using cash registers, which OSS Data replaced with two SAM4S 4700 POS terminals running NCC Reflection software. Shortly thereafter, the restaurant owner opened a second location and asked OSS Data to put in the same solution. Fast forward to 2015 and the oncoming EMV liability shift.